Cannot declare an attack unless you send 2 other cards you control to the GY. You can only use each of the following effects of "Super Express Bullet Train" once per turn. ● If all monsters you control are EARTH Machine monsters (min. 1): You can Special Summon this card from your hand. 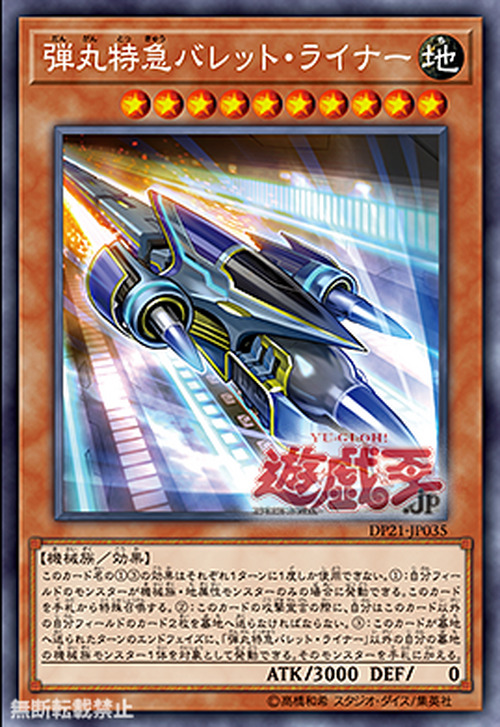 ● During the End Phase, if this card is in the GY because it was sent there this turn: You can target 1 Machine monster in your GY, except “Super Express Bullet Train”; add it to your hand. This monster is based on the Shinkansen; known as a Bullet Train outside Japan. It is one of the fastest trains ever produced, which may be represented by this monster's high ATK. Visually it also seems to be inspired by the Turbojet Train, which Rocket Arrow Express is based on. The card also has a few allusions to "". The front car appears to be shaped similar to that monster's head and the two monsters share the same ATK value.